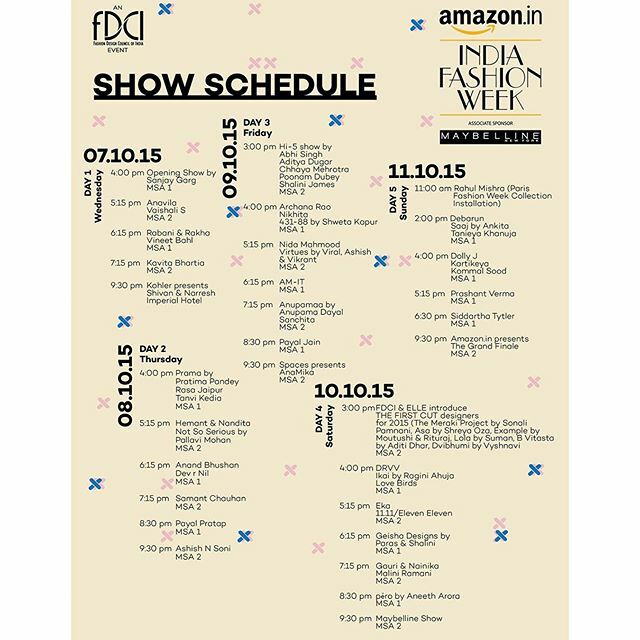 Amazon India Fashion Week Spring Summer 2016 - Show Schedule and Venue - AIFW SS16 | The Shopaholic Diaries - Indian Fashion, Shopping and Lifestyle Blog ! It's Fashion Week time again! The 26th edition of the Amazon India Fashion Week Spring-Summer 2016 in association with Maybelline New York is slated to be held at the NSIC Grounds, from Oct 7-11, 2015. Being Asia’s largest fashion and trade platform, it will offer thought-provoking ideas through conversational pieces of fashion in an attempt to handcraft it for a global audience by creating timeless portraits. This in turn, will make the `Made in India’ label a visual documentation of what lies at the core of our aesthetics. This season’s edition has an impressive list of 115 established style gurus as well as greenhorns, from all across the country. There will be 30 runway shows, which will engineer a unique language, dripping with indigenous crafts, modern luxury and counter-cultural influences. Mirroring what young India aspires for, as the new ‘cool’ meets engaging authenticity, this edition will have over 100 designer stalls at the exhibit area. The Amazon India Fashion Week Spring-Summer 2016 in association with Maybelline New York captures stunning moments in time as it threads together professionals from diverse fields: choreographers, makeup artists to stylists, giving business opportunities through evocative showcasing. Stay tuned for the Latest updates on the Fashion Week, my Outfits and much more!